Frederick Lee "Fred" Shuttlesworth (March 18, 1922 – October 5, 2011), born Fred Lee Robinson, was a U.S. civil rights activist who led the fight against segregation and other forms of racism as a minister in Birmingham, Alabama. He was a co-founder of the Southern Christian Leadership Conference, initiated and was instrumental in the 1963 Birmingham Campaign, and continued to work against racism and for alleviation of the problems of the homeless in Cincinnati, Ohio, where he took up a pastorate in 1961. He returned to Birmingham after his retirement in 2007. He helped Martin Luther King Jr. during the Civil Rights Movement. The Birmingham-Shuttlesworth International Airport was named in his honor in 2008. Born in Mount Meigs, Alabama, Shuttlesworth became pastor of the Bethel Baptist Church in Birmingham in 1953 and was Membership Chairman of the Alabama state chapter of the National Association for the Advancement of Colored People (NAACP) in 1956, when the State of Alabama formally outlawed it from operating within the state. In May 1956 Shuttlesworth and Ed Gardner established the Alabama Christian Movement for Human Rights to take up the work formerly done by the NAACP. The ACMHR raised almost all of its funds from local sources at mass meetings. It used both litigation and direct action to pursue its goals. When the authorities ignored the ACMHR's demand that the City hire black police officers, the organization sued. Similarly, when the United States Supreme Court ruled in December 1956 that bus segregation in Montgomery, Alabama, was unconstitutional, Shuttlesworth announced that the ACMHR would challenge segregation laws in Birmingham on December 26, 1956. On December 25, 1956, unknown persons tried to kill Shuttlesworth by placing sixteen sticks of dynamite under his bedroom window. Shuttlesworth somehow escaped unhurt even though his house was heavily damaged. A police officer, who also belonged to the Ku Klux Klan, told Shuttlesworth as he came out of his home, "If I were you I'd get out of town as quick as I could". Shuttlesworth told him to tell the Klan that he was not leaving and "I wasn't raised to run." In 1957 Shuttlesworth, along with Martin Luther King Jr., Ralph Abernathy from Montgomery, Joseph Lowery from Mobile, Alabama, T. J. Jemison from Baton Rouge, Louisiana, Charles Kenzie Steele from Tallahassee, Florida, A. L. Davis from New Orleans, Louisiana, Bayard Rustin and Ella Baker founded the Southern Christian Leadership Conference. The SCLC adopted a motto to underscore its commitment to nonviolence: "Not one hair of one head of one person should be harmed." Shuttlesworth embraced that philosophy, even though his own personality was combative, headstrong and sometimes blunt-spoken to the point that he frequently antagonized his colleagues in the Civil Rights Movement as well as his opponents. He was not shy in asking King to take a more active role in leading the fight against segregation and warning that history would not look kindly on those who gave "flowery speeches" but did not act on them. He alienated some members of his congregation by devoting as much time as he did to the movement at the expense of weddings, funerals, and other ordinary church functions. 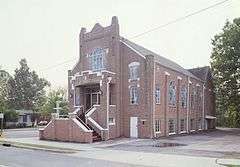 As a result, in 1961 Shuttlesworth moved to Cincinnati, Ohio, to take up the pastorage of the Revelation Baptist Church. He remained intensely involved in the Birmingham campaign after moving to Cincinnati, and frequently returned to help lead actions. When Shuttlesworth and his wife Ruby attempted to enroll their children in a previously all-white public school in Birmingham in 1957, a mob of Klansmen attacked them, with the police nowhere to be seen. His assailants included Bobby Frank Cherry, who six years later was involved in the 16th Street Baptist Church Bombing. The mob beat Shuttlesworth with chains and brass knuckles in the street while someone stabbed his wife. Shuttlesworth drove himself and his wife to the hospital where he told his kids to always forgive. In 1958, Shuttlesworth survived another attempt on his life. A church member standing guard saw a bomb and quickly moved it to the street before it went off. Shuttlesworth participated in the sit-ins against segregated lunch counters in 1960 and took part in the organization and completion of the Freedom Rides in 1961. After it became certain that the Freedom Rides were to be carried out, Shuttlesworth worked with the Congress of Racial Equality to organize the Rides and became engaged with ensuring the success of the rides, especially during their stint in Alabama. Shuttlesworth mobilized some of his fellow clergy to assist the rides. After the Riders were badly beaten and nearly killed in Birmingham and Anniston during the Rides, he sent deacons to pick up the Riders from a hospital in Anniston. He himself had been brutalized earlier in the day and had faced down the threat of being thrown out of the hospital by the hospital superintendent. Shuttlesworth took in the Freedom Riders at the Bethel Baptist Church, allowing them to recuperate after the violence that had occurred earlier in the day. The violence in Anniston and Birmingham almost led to a quick end to the Freedom Rides. However, the actions of supporters like Shuttlesworth gave James Farmer, the leader of C.O.R.E., which had originally organized the Freedom Rides, and other activists the courage to press forward. After the violence that occurred in Alabama but before the Freedom Riders could move on, Attorney General Robert F. Kennedy gave Shuttlesworth his personal phone number in case the Freedom Riders needed federal support. When Shuttlesworth prepared the Riders to leave Birmingham and they reached the Greyhound Terminal, the Riders found themselves stranded as no bus driver was willing to drive the controversial group into Mississippi. Shuttlesworth stuck with the Riders and called Kennedy. Prompted by Shuttlesworth, Kennedy tried to find a replacement bus driver. Unfortunately, his efforts eventually proved unsuccessful. The Riders then decided to take a plane to New Orleans (where they had planned on finishing the Rides) and were assisted by Shuttlesworth in getting to the airport and onto the plane. Shuttlesworth’s commitment to the Freedom Rides was highlighted by Diane Nash, a student activist in the Nashville Student Movement and a major organizer of the later waves of Rides. Nash noted, "Fred was practically a legend. I think it was important – for me, definitely, and for a city of people who were carrying on a movement – for there to be somebody that really represented strength, and that’s certainly what Fred did. He would not back down, and you could count on it. He would not sell out, [and] you could count on that." The students involved in the Rides appreciated Shuttlesworth's commitment to the principles of the Freedom Rides – ending the segregationist laws of the Jim Crow South. Shuttlesworth's fervent passion for equality made him a role model to many of the Riders. One of the 1963 demonstrations he led resulted in Shuttlesworth's being convicted of parading without a permit from the City Commission. On appeals the case reached the US Supreme Court. In its 1969 decision of Shuttlesworth v. Birmingham, the Supreme Court reversed Shuttlesworth's conviction, determining that circumstances indicated that the parade permit was denied not to control traffic, as the state contended, but to censor ideas. In 1963 Shuttlesworth was set on provoking a crisis that would force the authorities and business leaders to recalculate the cost of segregation. This occurred when James Bevel, SCLC's Director of Direct Action and Director of Nonviolent Education, initiated and organized the young students of the city to stand up for their rights. This plan was helped immeasurably by Eugene "Bull" Connor, the Commissioner of Public Safety and the most powerful public official in Birmingham, who used Klan groups to heighten violence against blacks in the city. Even as the business class was beginning to see the end of segregation, Connor was determined to maintain it. While Connor's direct police tactics intimidated black citizens of Birmingham, they also created a split between Connor and the business leaders. They resented both the damage Connor was doing to Birmingham's image around the world and his high-handed attitude toward them. Shuttlesworth's activities were not limited to Birmingham. In 1964 he traveled to St. Augustine, Florida (which he often cited as the place where the civil rights struggle met with the most violent resistance), taking part in marches and widely publicized beach wade-ins. In 1965 he was active in the Selma Voting Rights Movement, and its march from Selma to Montgomery which led to the passage of the Voting Rights Act of 1965. Shuttlesworth thus played a role in the efforts that led to the passage of the two great legislative accomplishments of the Civil Rights Movement. In later years he took part in commemorative activities in Selma at the time of the anniversary of the famous march. And he returned to St. Augustine in 2004 to take part in a celebration of the fortieth anniversary of the St. Augustine movement there. In 1978, Shuttlesworth was portrayed by Roger Robinson in the television miniseries King. In 1998 Shuttlesworth became an early signer and supporter of the Birmingham Pledge, a grassroots community commitment to combating racism and prejudice. It has since then been used for programs in all fifty states and in more than twenty countries. On January 8, 2001, he was presented with the Presidential Citizens Medal by President Bill Clinton. Named President of the Southern Christian Leadership Conference in August 2004, he resigned later in the year, complaining that "deceit, mistrust and a lack of spiritual discipline and truth have eaten at the core of this once-hallowed organization". In 2004, Shuttlesworth received the Award for Greatest Public Service Benefiting the Disadvantaged, an award given out annually by Jefferson Awards. During the 2004 election that overturned a city charter provision that prohibited Cincinnati's City Council from adopting any gay-rights ordinance, Shuttlesworth voiced advertisements urging voters to reject the repeal, saying "The thing that I disagree with is when gay people ... equate civil rights, what we did in the '50s and '60s, with special rights ... I think what they propose is special rights. Sexual rights is not the same as civil rights and human rights." Shuttlesworth married Sephira Bailey in 2007. On July 16, 2008, the Birmingham, Alabama, Airport Authority approved changing the name of the Birmingham's airport in honor of Shuttlesworth. On October 27, 2008, the airport was officially changed to Birmingham-Shuttlesworth International Airport. On October 5, 2011, Shuttlesworth died at the age of 89 in his hometown of Birmingham, Alabama. The Birmingham Civil Rights Institute announced that it intends to include Shuttlesworth's burial site on the Civil Rights History Trail. By order of Alabama governor Robert Bentley, flags on state government buildings were to be lowered to half-staff until Shuttlesworth's interment. He is buried in the Oak Hill Cemetery in Birmingham. ↑ Houck, Davis W.; Dixon, David E., eds. (2006). Rhetoric, Religion and the Civil Rights Movement 1954-1965. Waco: Baylor University Press. p. 250. ISBN 1932792546. Retrieved 2015-01-18. 1 2 3 4 5 6 Manis, Andrew M (1999). A Fire You Can't Put Out: The Civil Rights Life of Birmingham's Reverend Fred Shuttlesworth. chatte, Alabama: University of Alabama Press. ISBN 0-8173-0968-3. ↑ Arsenault, Raymond (2006). Freedom riders: 1961 and the struggle for racial justice. Oxford UP. p. 106. ISBN 978-0-19-513674-6. ↑ African American Registry. “Fred Shuttlesworth, Minister and Leader!” http://www.aaregistry.org/historic_events/view/fred-shuttlesworth-minister-and-leader. ↑ Manis, Andrew M. (Summer–Fall 2000) "Birmingham's Reverend Fred Shuttlesworth: unsung hero of the civil rights movement." Baptist History and Heritage, http://findarticles.com/p/articles/mi_m0NXG/is_3_35/ai_94160959/?tag=content;col1. ↑ Arsenault, Raymond (2006). Freedom riders: 1961 and the struggle for racial justice. Oxford UP. p. 148. ISBN 978-0-19-513674-6. ↑ Arsenault, Raymond (2006). Freedom riders: 1961 and the struggle for racial justice. Oxford UP. pp. 159–62. ISBN 978-0-19-513674-6. ↑ Arsenault, Raymond (2006). Freedom riders: 1961 and the struggle for racial justice. Oxford UP. pp. 166–9. ISBN 978-0-19-513674-6. 1 2 3 Arsenault, Raymond (2006). Freedom riders: 1961 and the struggle for racial justice. Oxford UP. pp. 170–1. ISBN 978-0-19-513674-6. ↑ The Birmingham News (February 26, 2006). “The Road to Change.” http://www.al.com/unseen/stories/index.ssf?cutlines2.html. ↑ Arsenault, Raymond (2006). Freedom riders: 1961 and the struggle for racial justice. Oxford UP. p. 172. ISBN 978-0-19-513674-6. ↑ McWhorter, Diane (2001). Carry Me Home: Birmingham, Alabama, the Climactic Battle of the Civil Rights Revolution. Simon and Schuster. ISBN 0-7432-1772-1. ↑ "Birmingham Pledge". Encyclopedia of Alabama. 2011-05-12. Retrieved 2011-10-06. ↑ "O'Connor wins top honor at Jefferson Awards fete". AP. June 24, 2004. ↑ Aldridge, Kevin (November 3, 2004). "City voters repeal amendment on gay rights". The Cincinnati Enquirer. ↑ Johnston, John; Alltucker, Ken (October 17, 2004). "Coming to terms with gay issues: Region leans toward tolerance, not acceptance". The Cincinnati Enquirer. ↑ Thornton, J. Mills, III (2002). Dividing Lines: Municipal Politics and the Struggle for Civil Rights in Montgomery, Birmingham, and Selma. Tuscaloosa: University of Alabama Press. p. 189. ISBN 081731170X. Retrieved 2015-01-18. 1 2 Schudel, Matt (October 6, 2011). "Fred L. Shuttlesworth, courageous civil rights fighter, dies at 89". The Washington Post. Retrieved 2011-10-10. ↑ Gates, Verna (October 5, 2011). "Birmingham civil rights leader Fred Shuttlesworth dies". Reuters. Retrieved 2011-10-06. ↑ Washington, Dennis. "Rev. Fred Shuttlesworth passes away". MyFoxAL.com. Retrieved 2011-10-06. ↑ Stewart, Sherrel. "Alabama Gov. Robert Bentley orders flags on state buildings at half staff for Rev. Shuttlesworth". al.com. Retrieved 2011-10-06. ↑ Garrison, Greg (October 24, 2011). "Shuttlesworth buried at Birmingham's Oak Hill after final tributes". AL.com. Curnutte, Mark (January 20, 1997) "In the Name of Civil Rights: The Rev. Fred Shuttlesworth carries on a 40-year fight as the movement's 'battlefield general'." Cincinnati Enquirer – accessed January 20, 2007.